Subscription boxes seem to be all the rage, and why should our four legged doggy friends miss out, so here are the subscription boxes for dogs that I have found so far, please comment below if I have missed any, or if you have tried any of them, from dog toys and treats through to food parcels and monthly flean and worming treatments, there really is a subscription box for everything! 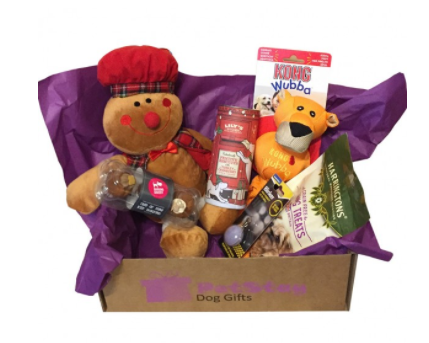 My Pet Gift Box is the UK’s only 100% personalised subscription box for dogs. Our team of experts individually handpick and deliver a box of top brand dog toys, natural treats & chews and accessories to your door when it suits you – monthly, every 3 months or every 6 months. 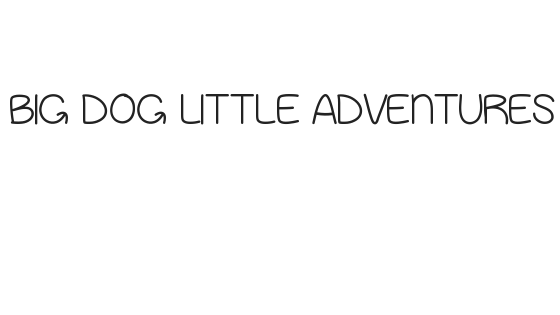 #PupPost is an exciting monthly adventure by Puppy Essentials! With a different theme each month. Every Box contains at least 2 toys and 3 treats paw picked by our in house experts and delivered for free by Royal Mail. We pride ourselves on selecting the coolest, quirkiest and eco-conscious products around to ensure that your dog is the trendiest, healthiest pooch in town. The dog treats and toys in your box are specially hand picked every month by our dog experts. We guarantee a fantastic mix of exciting items that your dog will enjoy. Exactly what is in each monthly treat box depends on which box you select. 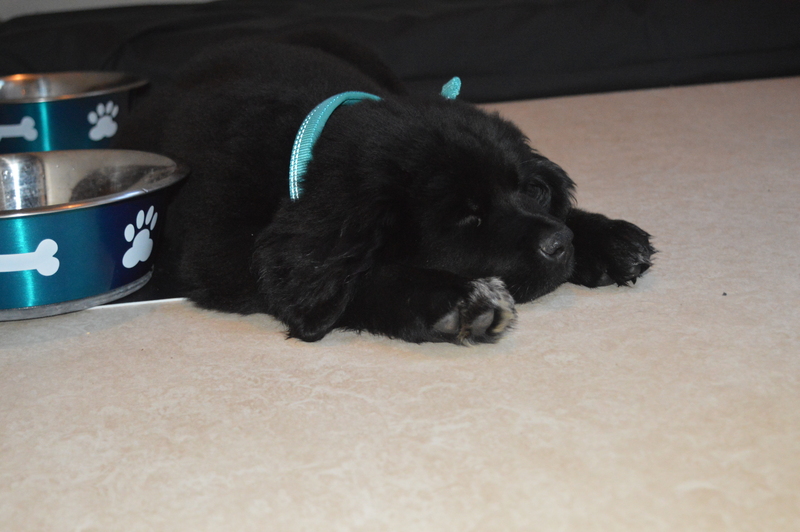 Our office mascot, Callie the Spaniel makes sure she helps testing the treats & toys!. •Order now to receive this months goodie box. •Like free delivery? You got it, our boxes are free delivery too! •You can cancel your box subscription whenever you like. •Every month too much? No problem, pause or alter your boxes easily. •We know our stuff, and we guarantee your will love the service you receive. Price : Snack Pack consists of 3-4 healthy treats £9.99 per month.Mega Box – 5-7 quality treats and toys £17.99. Healthy, tasty and nutritious dog treats delivered through your letter box from as little as £5.49 per box! From as low as £5.49 + 25% off your 1st box. Barktastic! 6 products suited to your dog’s profile, delivered to your doorstep once a month! Delicious treats, toys, accessories and hygiene products : our teams only selects the best products for your pooch! Super savings : the price of subscription to our boxes is much cheaper than the value of the products included! Small or large, short haired or long, puppy or adult…Tell us everything about your dog so that we can select the best products for him, which include yummy treats, toys, accessories and hygiene products. Choose a plan, we offer 12 months, 6 months, 3 months or 1 month subscriptions, it’s up to you what you choose! You can choose to suspend the subscription at any moment. Boxes are sent each month towards the 10th, you receive them between the 15th and 25th of the month. Your furball will be ready for hours of fun with playful toys, tasty snacks and all in all you will have a very happy pup! Price: £19.90 monthly. £56.70 3 months. £107.40 6 months. £190.80 12 months. The size of your dog is important to us so we can tailor treats, toys and other goodies. Choose from a 1 month plan, or the better value plans of 3 months or 6 months. You can cancel at any time. Choose our surprise selection, or customise to create a more personalised selection. Lastly, submit payment and delivery details – boxes will be sent out around the 14th of each month. We offer a wide range of natural, top quality and more exclusive items which are not commonly found in pet shops. We choose only the finest quality products from the many wonderful suppliers we use. You can customise your box when you check out, by opting to use our simple rating system. Price: £21.99 1 month. £20.50 3 months. £18.95 6 months. 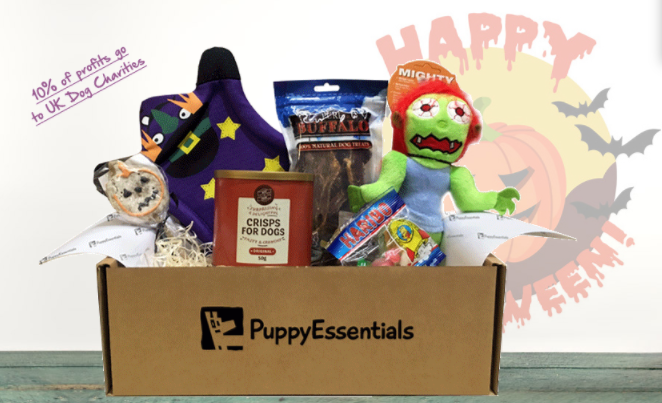 Barks & Bunnies offer lots of different subscription boxes for your dog. Offering a one time only purchase or repeating subscription service. 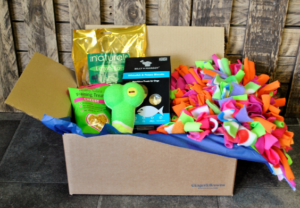 More than 10 different themed boxes to suit your pets needs, choose how frequently to receive your delivery, manage your own subscription at anytime of day or night 7 days a week PLUS variety is guaranteed with no two Happy Boxes ever the same! Happy Dog Boxes are available for lots of different dogs, the boxes are called – Classic, Interactive, Luxury, Multi, Old Soul, Premium, Puppy, Tough Stuff, Treats and Treats Plus. Prices: Prices range from £9.99 for a treat box through to £39.99 for a Luxury and Puppy Box. We’re keen to make sure that everything you receive in your box is not only great quality but practical too – there’s absolutely no point us sending a bar of soap if you’ve told us you don’t groom at home! So each box is tailored to what you’ve told us about your hounds. We’ve got the ultimate hound toy box. All toys are made from natural, environmentally-friendly or sustainable materials and aim to provide maximum fun! Squeaky soft toys, Toys to share, Frisbees, Balls to chase and Interactive toys. To keep your hound in tip-top condition, we include grooming and general care products as well as practical accessories that we think you’ll enjoy. Natural hand-made soaps and shampoos, Dental care products, Health supplements, Emergency wipes for stinky smells and Biodegradable poo bags. As animal lovers, we know just how much money pet owners can spend on their beloved furry friends each month. 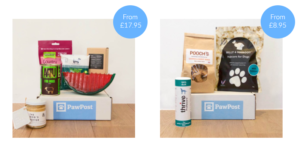 Here at PawPost, we deliver fantastic, monthly goody boxes which save our customers both time and money. With every box you are guaranteed to make great savings! Our monthly boxes offer a range of premium, natural and eco-friendly toys. New and exciting products before they hit the high street or other retail outlets, Natural food made from ingredients that you can trust giving to your four-legged friend and a selection of fantastic products and accessories to keep your beloved pet happy. We serve up a huge variety of delicious, healthy and hearty dog treats. Choose your frequency to suit your dog. We will hand select a unique variety in every box you receive. Our boxes come bursting with some very special items each month. Fun toys, healthy organic treats & cool accessories that your dog is sure to ruv! Tell us how big your dog is. From small & sweet to big & burly, we’ve got boxes to suit all sizes. We offer 1, 6 & 12 month plans. Discounts apply for longer subscriptions. Cancel anytime. ScoobyBox is shipped on the 15th of each month. Get those tails wagging! Each box comes packed with healthy organic treats and high-quality fun toys for your dog. Price: £19.99 per month 12-month plan. £22 per month 6 month plan. £26 per individual month. 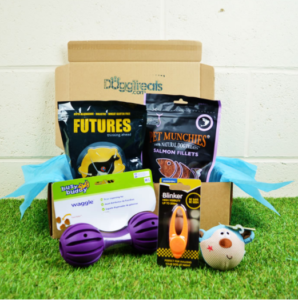 Each month we will deliver a box that contains fantastic products to your door, including a combination of healthy treats, eco-friendly toys and accessories that have been carefully selected according to your dog’s or cat’s needs and size. You can choose from our three subscription plans: The three-month plan, the six-month plan or the twelve-month plan. If you select a monthly plan, you will pay each month for your box. If you select the three-month plan, you are committed to pay each month during three months but here comes the great news, you will get a discounted price for your three Barky Boxes. An even further discount would be applied if you selected the six-month plan or, even better, the twelve-month plan. Price : £21.99 single month. £19.99 3 month subscription. £18.99 6 months. £17.99 for 12 months. The inspiration for our dog subscription boxes all started with a sausage. Nope not the kind you put in a hot dog. The Dachshund kind to be precise. Rachel and Tom rescued Rupert the Dachshund from the Dogs Trust in August 2016. He was a funny little thing, who had a ponchant for socks and was fussy about food. They knew they were in for a challenge to keep him interested particularly, as despite everything, he always chose the sock over the fun new toy or gave one sniff of his food and would saunter off in a strop! Rachel and Tom spent a lot of time and money on trying to find the right food for Rupert, that didn’t upset his stomach or make his skin itchy, buying various toys that either got relagated to the bottom of the pile or destroyed in a few minutes, to treats that weren’t high value enough. It turned out that Rachel and Tom weren’t the only ones struggling with this dilemma and so armed with the knowledge that a fussy dog brings, Wag & Bone dog subscription boxes was born. Every single product that goes into our dog subscription boxes has been tried and tested by Rupert, all sourced from brands we love and trust. All food and treats are made from natural ingredients, accessories have been given the paw of approval and all toys have passed the Dachshund test. (Trust us, they love to destroy things, and they’re pretty efficient at it). We only work with vendors who care deeply about the health and happiness of dogs as much as we do. Prices: Small/Medium dogs £24.50 12 months. Big Dawgs £29.50 12 months. Tough Chewers £34.50 12 months. We are a small, Yorkshire based business who are committed to bringing exciting dog treats to pups all around the UK. We pride ourselves on our quirky ‘doggy menu’ with a humansied twist – we know owners tend to see their pets as part of the family, so have come up with a range of recipes that mean your pooch will never be left out – including Fish and Chips, Sunday Roast and Full English. 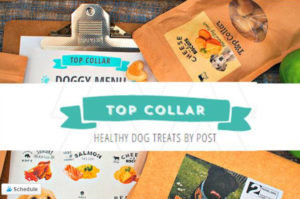 Top Collar is a regular dog treat subscription service, so you never have to worry about running out of your favourite treats! Our treats are hand baked each month and delivered to customers in letterbox friendly packaging, all personalised with your cutest doggy photo. You can choose to receive treats fortnightly or monthly and once you’re a member you can manage your boxes easily online using our members page. There’s no commitment, so you can pause, cancel or change the frequency of your deliveries any time you like! Jammy Pet is a monthly subscription hamper, for pets! Each hamper will include a variety of snacks and toys, as well as health and pamper products to enhance the wellbeing and happiness of your pet! It doesn’t matter if you’ve got a new furry family member, or if you’ve had a faithful best pet friend for years — everyone benefits from Jammy Pet hampers. Being a Jammy Pet pawscriber also means special deals, promotions and competitions through our Jammy Pet community and newsletter. If you like an item you’ve received in your Jammy Pet hamper, please let us know and we’d be delighted to tell you where you can get more of it. The ones that love dogs like us understand what we mean when we say that the bond between a person and a dog can be stronger than any other type of bond. The ones who don’t will maybe never understand this. Basically, where others see sacrifice, we see gratification. Because we know that everything good that we give them, will be returned. 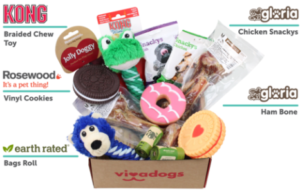 Vivadogs comes out of this love for dogs, a monthly box with 5 different premium products, especially thought to celebrate, nourish and strengthen the bond with your dog. Prices: £19.90 monthly. £14.90 with 6 month subscription. £13.90 for 12 months subscription. We’re the one subscription company that focuses ONLY on power chewers! We deliver toys and treats based on your dog’s weight and allergy preferences. 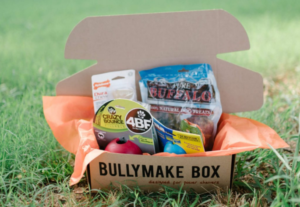 You get hand selected perfection in every Bullymake Box! You will never pay a dime on shipping in the United States! That’s on us, no matter what you order. Your first order is hand picked, packed, and shipped in just 2-3 business days. $8/month to Canada and Global shipping varies by destination! Prices: $39 1 month. $108 every 3 months. $204 every 6 months. $372 per year. 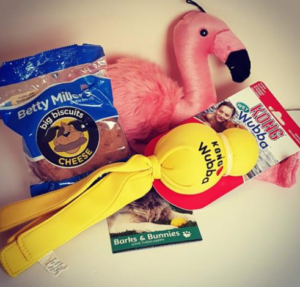 Our PetStay Gift Boxes are filled with a selection of great quality toys, snacks and accessories for your dog! You can order your Gift Box in three simple steps. Simply choose the size of your dog, order the size best suited to you, check out and we will deliver the box to your door! Our Christmas gift boxes are the perfect gift to surprise your favourite furry friend on Christmas morning, filled with toys, treats & other doggy items! We have included a special personalised card, no need to worry about wrapping as we have that covered with our ribbon designed boxes complete with their own name label and gift bow! Prices: Small Dog £21.99. Medium Dog £22.99. Large Dog £23.99. 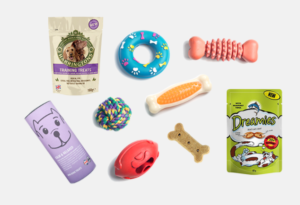 Get a monthly assortment of premium dog items from top brands, helping you discover innovative toys, natural treats, grooming and well being products your dog will love. 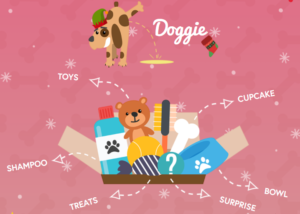 Doggyparcel was born because we love helping dog owners bond with their pets through play, great treats, grooming and training aids. We’ve learnt the hard way that the time we’re blessed with our pets is never long enough – so make the most of every precious moment! Explore and Enjoy! Make your pup go doggone wild with excitement with a monthly mystery crate packed full of fun toys, tasty treats and awesome apparel for your furry friend. The Tail Wagger boxes are a great way to always have new and exciting products for your dog, delivered to your door. If you need more convincing, here is a list of all the reasons why you should try us out! We take QUALITY seriously – Only the best and healthiest products will be in our box. It’s Tailor Made – Every box we send is unique. We will hand pick every item based on what you tell us and your needs. so you and your doggie are always happy with what you get. It’s Convenient – Just subscribe and every month you’ll have a fresh box delivered to your door. It’s great value – You’ll always pay less for the box than buying each item separately. It’s fuss free – You can always cancel your subscription within the notice period. We deliver brand leading flea and worming treatments to pets across the UK. All our boxes are tailored specifically to your dog or cat and delivered just when their treatment is due. When it arrives in the post it’s time to dose. One size doesn’t fit all. We tailor your pet’s treatment plan based on their age, breed and weight. Every 4 weeks you will receive a health box containing the flea and worming treatments your pet needs that month. You can enjoy total peace of mind knowing that your pet’s flea and worming treatments are always up to date. Premium Small Dog 3-10kg £10.99 per month. Premium Medium Dog 10-20kg £11.99 per month. Premium Large Dog 20-40kg £14.99 per month. Premium Extra Large Dog 40-60kg £16.99 per month. Purplebone introduces purplebox – an essential monthly subscription box for any breed and size, your dog will be waiting every month for purplebox day! The purplebox will vary each month. Your dog will receive a range of luxury toys, treats, waste bags and cosmetics plus a free surprise gift for their owners too! Choice of Small Dog (up to 15kg) Medium Dogs (over 15kg) and Large Dogs over 25kg, all priced at £24 per month. They also offer a Mixed Treat Selection for £14.99. Choose which Theme you would like! All of our Themes have 3-5 items, but each Theme has a bias to e.g. dogs that love to destroy things! ( N.B: Our Chews & Treats Box contains 3-4 items). All dogs are different, so our boxes are too! You can tailor your box, making Tail Mail a subscription for YOUR dog! Your Tail Mail will arrive every month, and with no fixed contracts, you can stop at any time! Remember, you gain discounted boxes the longer you are with us for! Tail Mail is an expanding part of Ginger&Browns. The team use all their expertise, experience and education, as well as feedback and product testing through Ginger&Browns, to carefully select products for your Tail Mail subscription using the information you give us! There are six different types of boxes to choose from. 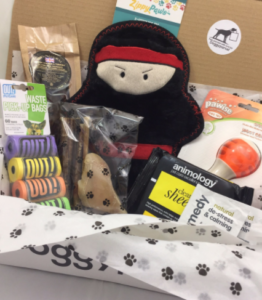 The Original Box (£24 monthly)- This box delivers a mixture of three to five high quality chews, treats, toys, grooming products or novel items. We search high and low to source exciting products with an emphasis on using independent UK-based producers. You tell us your dog’s likes and dislikes, and we tailor the contents to your pooch! 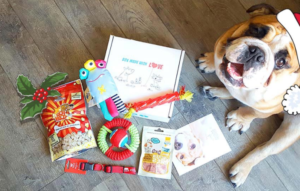 The Playful Pooch Box (£24 monthly)- This box delivers a mixture of three to five high quality chews, treats, toys, grooming products or novel items with an emphasis on encouraging your pooch to play! This includes products such as training treats, games, puzzles and toys. We search high and low to source exciting products with an emphasis on using independent UK-based producers. You tell us your dog’s likes and dislikes, and we tailor the contents to your pooch! The Wholesome Hound Box (£24 monthly) – This box delivers a mixture of three to five high quality chews, treats, toys, grooming products or novel items with an emphasis on products that are grain-free, low fat, contain all natural ingredients, made from sustainable materials or otherwise Eco-friendly. We search high and low to source exciting products with an emphasis on using independent UK-based producers. You tell us your dog’s likes and dislikes, and we tailor the contents to your pooch! 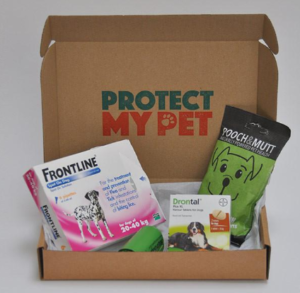 The Destroyer Box (£24 monthly) – This box delivers a mixture of three to five high quality chews, treats, toys, grooming products or novel items. Although nothing is ever indestructible to dogs, with these items your dog can really get their teeth into them, and they will be extra-durable and should last them longer than standard ones. We search high and low to source exciting products with an emphasis on using independent UK-based producers. You tell us your dog’s likes and dislikes, and we tailor the contents to your pooch! The Chews & Treats Box (£12 monthly)- This box delivers a mixture of three to four high quality chews and treats. Chewing is an effective way of keeping your dog’s teeth and gums in good health, and this box is a great way to be introduced to new ideas! We search high and low to source exciting products with an emphasis on using independent UK-based producers. You tell us your dog’s likes and dislikes, and we tailor the contents to your pooch! The Multi-Mutt Box (£43 monthly) – This monthly subscription delivers two themes! You can tell us which two you would like in the questions below, and see more information about each theme in the “Our Boxes” tab at the top of this screen! We deliver the multi-dog box with the two themes wrapped separately inside a single box, and pass on the delivery savings to you, giving you a £5 saving on buying two separate boxes! So if you are looking for a gift for your fur baby this Christmas check these out, if you know of any more, let me have the link and I will include it. This is a surprisingly fun idea for pet owners. I imagine someone might discover a new chew toy or treat their dog might really love. Will have to definitely pass this along. I’m so excited to get these for my dogs in the future! I have always loved recieving subscription boxes and I feel like they’re a great way to test and try out new products! For dogs it’s like a regular delivery of treats and toys! I love it! 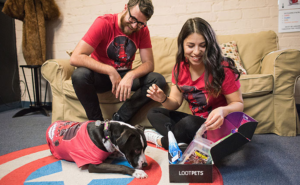 I love the idea of subscription boxes for pets! I may just have to commit to this one! 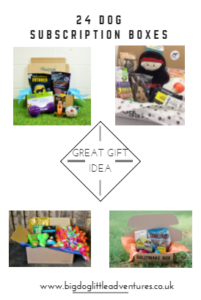 There really are some amazing boxes for dogs out there isn’t there – I am loving the idea of getting to treat the pooch to something fun every month I may just have to sub! What a great idea! My dogs must get so bored sometimes, and I’m forever trying to keep them stimulated by brining home ew things for them. This is so much easier and a great way for them to enjoy some treats and new products! Wow those are really great subscription boxes for dogs.. Good and many products can be selected.. We don’t have dogs subscription box know India.. This sounds like a wonderful idea. It would make a great Christmas gift for a dog lover. My puppy Coco would love this, a great war to try new products without committing to full size or spending a fortune. Such fabulous gift ideas for dogs! Beats a simple chew toy under the Christmas tree, that’s for sure! These look awesome! I didn’t realize there were so many choices for a pet subscription box. Wow, I didn’t realise there was such a variety of subscriptions boxes on the market for dogs! Finding any one of them under the tree would definitely make a pooch VERY happy this Christmas. I didn’t hear about subscription boxes for dogs before but I find it to be a great idea. Our local stores only have a limited range of products for pets so getting a different selection every month through a box sounds brilliant! wow what a fab idea! I;ve never seen them for dogs before, that’s such a great idea and something we, and my dog, would love! I love the whole crate idea and so many company are catching on this. It allows us to get so much more of a variety a one time. There are so many subscription boxes available for dogs now, I love the variety. I sometimes treat my dog Bailey to a box and he loves it, never turns down treats or a new toy. That’s so cool that they have so many sub boxes for doggies. If I had a dog I would probably spoil it in getting a couple of these for them. Wow these are cool items for dogs, my mother-in-law would love this one for her little baby. I’m sure she’ll love it! This is such a cute idea! I think my dog would love it! My dogs are subscribed to BarkBox, but I had never heard of this one before. We’ll have to give it a try. My dogs love getting special goodies!! I love the whole concept of this! What a wonderful time to be a dog in the world! I love subscription boxes, especially those that offer a great bargainon quality items. Such a cute idea for dog lovers! What a fun idea! This would make a great doggy Christmas gift! We’ve just got a puppy so I’ve read this with interest – I didn’t know there were so many dog subscription boxes. They would be perfect for us as we could try lots of different stuff for our puppy! I have never heard of anything like this for pets, what a great idea. I have a daughter in law that would just love this! 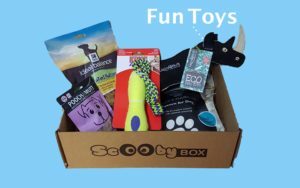 Those are such awesome subscription boxes for dogs! Love those fun ideas. Honestly love the sound of all of these! I know my two Dalmatians would absolutely love them, too. It’s so great that you have something for your dog to look forward to… I wonder if they have something like this for cats, too? 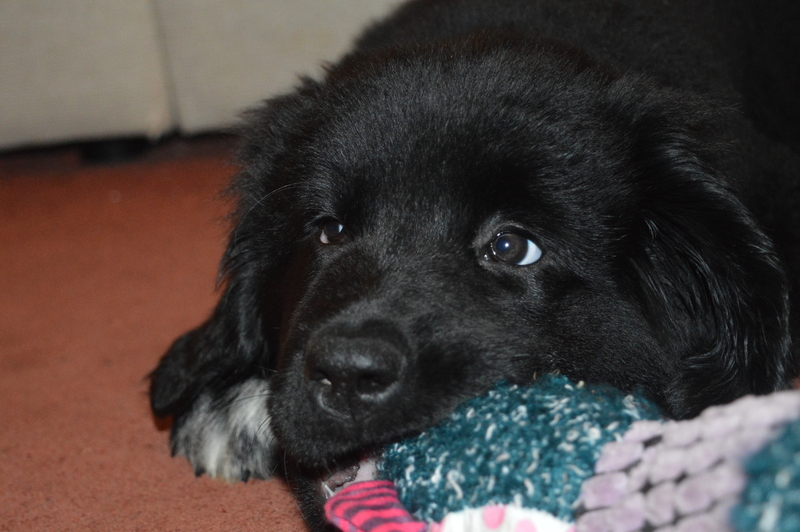 Merrie The Newfoundland Puppy has arrived!